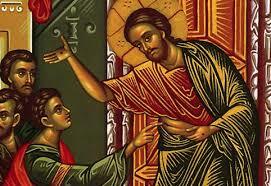 Jesus returns to his disciples and, rather than chastise them for their betrayal and abandonment, offers them peace. Thomas doubts, but Jesus is accepting of him as well, and in that acceptance, Thomas finds his Savior. 4:32 Now the whole group of those who believed were of one heart and soul, and no one claimed private ownership of any possessions, but everything they owned was held in common. 33 With great power the apostles gave their testimony to the resurrection of the Lord Jesus, and great grace was upon them all. 34 There was not a needy person among them, for as many as owned lands or houses sold them and brought the proceeds of what was sold. 35 They laid it at the apostles’ feet, and it was distributed to each as any had need. Our psalm is one of the “Songs of Ascent,” pilgrim songs sung on the journey to Jerusalem to celebrate one of the pilgrim festivals. As a response to our first reading, it emphasizes the ideal of unity among us, using two images: the anointing of a priest, and the “dew” of the great Mt. Hermon, which collects into streams that provide precious water for the land (it feeds the Sea of Galilee). Throughout Eastertide this year we read from the First Letter of John. The opening of the letter echoes the opening of John’s Gospel and many of its themes: the word becoming flesh (the incarnation), light versus darkness, the goal of “complete joy,” and the commitment to the truth. The end of this passage is an exhortation to honesty about and confession of our sins. Those who believe they are without sin (and it appears that there were some in the community to which John is writing that believed as much about themselves) deceive themselves. 1:1 We declare to you what was from the beginning, what we have heard, what we have seen with our eyes, what we have looked at and touched with our hands, concerning the word of life—2 this life was revealed, and we have seen it and testify to it, and declare to you the eternal life that was with the Father and was revealed to us—3 we declare to you what we have seen and heard so that you also may have fellowship with us; and truly our fellowship is with the Father and with his Son Jesus Christ. 4 We are writing these things so that our joy may be complete. 5 This is the message we have heard from him and proclaim to you, that God is light and in him there is no darkness at all. 6 If we say that we have fellowship with him while we are walking in darkness, we lie and do not do what is true; 7 but if we walk in the light as he himself is in the light, we have fellowship with one another, and the blood of Jesus his Son cleanses us from all sin. 8 If we say that we have no sin, we deceive ourselves, and the truth is not in us. 9 If we confess our sins, he who is faithful and just will forgive us our sins and cleanse us from all unrighteousness. 10 If we say that we have not sinned, we make him a liar, and his word is not in us. 2:1 My little children, I am writing these things to you so that you may not sin. But if anyone does sin, we have an advocate with the Father, Jesus Christ the righteous; 2 and he is the atoning sacrifice for our sins, and not for ours only but also for the sins of the whole world. Our Gospel reading this morning is read every year on this Second Sunday of Easter (the only instance of a Gospel reading repeating year after year in the entire cycle of readings). The reading is composed of two scenes. The first is John’s account of the first appearance of the risen Jesus to the disciples. For John it is also the formation of the Church (including the gift of the Holy Spirit). Jesus’ forgiveness of the disciples is extraordinary given their betrayal and abandonment of him. Moreover, he also gives them the power of forgiveness! The second scene is the familiar story of Thomas, the disciple missing from the first appearance. Thomas needs physical proof, for which we can hardly blame him. The story is partially a set up for the important statement, “Blessed are those who have not seen and yet have come to believe.” Note that by “the Jews” in the first verse is meant the religious authorities, not all Jews. 20:19 When it was evening on that day, the first day of the week, and the doors of the house where the disciples had met were locked for fear of the Jews, Jesus came and stood among them and said, “Peace be with you.” 20 After he said this, he showed them his hands and his side. Then the disciples rejoiced when they saw the Lord. 21 Jesus said to them again, “Peace be with you. As the Father has sent me, so I send you.” 22 When he had said this, he breathed on them and said to them, “Receive the Holy Spirit. 23 If you forgive the sins of any, they are forgiven them; if you retain the sins of any, they are retained.” 24 But Thomas (who was called the Twin), one of the twelve, was not with them when Jesus came. 25 So the other disciples told him, “We have seen the Lord.” But he said to them, “Unless I see the mark of the nails in his hands, and put my finger in the mark of the nails and my hand in his side, I will not believe.” 26 A week later his disciples were again in the house, and Thomas was with them. Although the doors were shut, Jesus came and stood among them and said, “Peace be with you.” 27 Then he said to Thomas, “Put your finger here and see my hands. Reach out your hand and put it in my side. Do not doubt but believe.” 28 Thomas answered him, “My Lord and my God!” 29 Jesus said to him, “Have you believed because you have seen me? Blessed are those who have not seen and yet have come to believe.” 30 Now Jesus did many other signs in the presence of his disciples, which are not written in this book. 31 But these are written so that you may come to believe that Jesus is the Messiah, the Son of God, and that through believing you may have life in his name. The Scripture quotations (except for the psalm) are from the New Revised Standard Version Bible, copyright © 1989 by the Division of Christian Education of the National Council of Churches of Christ in the U.S.A., and are used by permission. All rights reserved. The Psalm translation is from The Book of Common Prayer. Commentaries are copyright © 2017, Epiphany ESources, 67 E. Main St., Hornell, NY 14843, www.epiphanyesources.com. All rights reserved. Permission to copy and edit for church services is given, provided this attribution remains.